Kill Devil Hills beach. Back hoe is pushing sand in front of beach front homes. The Atlantic Ocean is a fickle neighbor. Right now the Outer Banks seas are calm and blue with with a little bit of chop in the waves as they break. That’s a pretty typical spring, summer and fall surf report. The waves are a bit smaller than usual and especially as summer comes the break tends to get a little more even–great for surfers. But for the most part, Outer Banks visitors don’t see the angry ocean, the six, eight or ten foot seas that take such a toll on our shoreline. However, property owners certainly need to be aware of the the Outer Banks relationship with our neighbor to the east. The fact is our shoreline has been in retreat for some time, and although small scale efforts are helpful–usually pushing sand back on the beach after a storm deposits a dune on the road–it is becoming apparent larger mitigation efforts are needed. Beach nourishment is the buzz phrase making the rounds, and under the right circumstance it has a track record of success. 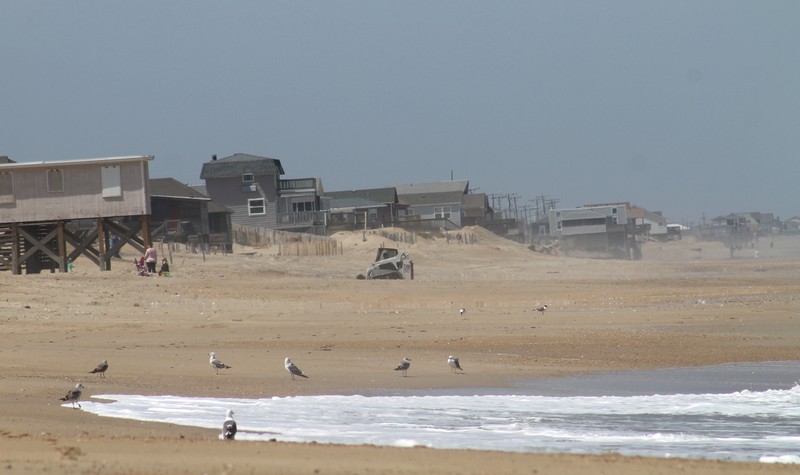 Nags Head, as an example, finished their beach nourishment project in the spring of 2012 and judging from the damage–or lack of damage–caused by Sandy, it performed as advertised. There are no plans at this point in time to move forward with another nourishment project anywhere on the Outer Banks. However, the towns of Kill Devil Hills, Kitty Hawk and Duck are all actively considering projects, although none of them have begun the permitting process. Property owners need to be aware of this. It is disruptive and expensive . . . very expensive, though certainly not as expensive as moving a house–as just happened in Duck–or a flood damaged home. There are circumstances where the U.S. government will take on the project, but the federal permitting process is so expensive and so time consuming that local jurisdictions are actively seeking ways to proceed on their own. That was certainly the case with Nags Head where they issued bonds to fund the project and voted a 1% increase in property tax to pay for the bonds. At $37 million the Nags Head project is the largest municipally funded beach nourishment project to date in the United State. Part of the review process that the towns are undertaking includes how to pay for the project. It is not by any means the only thing that is examined. Suitability of the beach for nourishment is examined; which areas need to be nourished–the rate of retreat varies wildly along our shoreline from l5-20’ per year to less than a foot. What is causing the erosion–the Outer Banks sits on an ancient river delta and the river channels that still remain under water make nourishment much more difficult in some areas. Whether or not these projects go forward is certainly anyone’s guess at this point in time. Beach nourishment is controversial and not everyone feels it is either appropriate or effect. That, however, is a debate for a later blog.